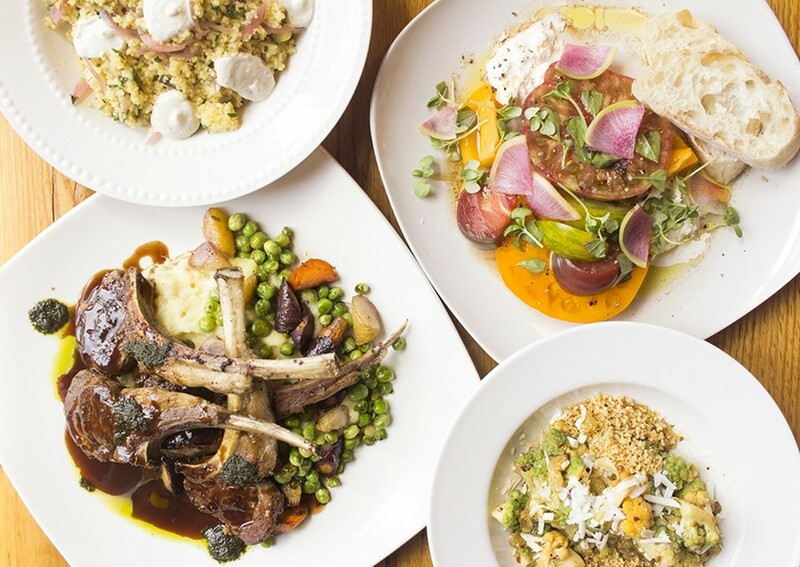 Highlights at Polite Society include citrus couscous, heirloom tomato salad, lamb chops and the Italian broccoli dish brassica affogati. 1923 Park Avenue, 314-325-2553. Mon.-Thurs., 5:30-10 p.m.; Fri, 5:30-11 p.m.; Sat., 5:30-11 p.m. ; Sun., 5:30-9 p.m. Sat. and Sun. brunch, 11 a.m.-2 p.m. If you want to understand the sort of world that Polite Society's owners Brian Schmitz and Jonathan Schoen want to create, you must try the confit chicken wings. 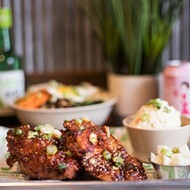 Drummies and wings are slow-cooked in their own rendered fat, infusing the meat with richness, before being fried so that the exterior gets a nice, crispy coating. 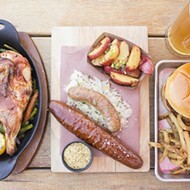 In a nod to the restaurant's genteel vibe, the meat pulls apart in hunks off the bone with barely a prod, saving you the embarrassment of having to gnaw awkwardly in polite company. However, it's the accompanying sauces that best exemplify the restaurant's vision. A lip-tingling, almost menthol Szechuan sauce is provided, along with a creamy Cajun-inspired aioli. Mustard hot enough to clear your sinuses is softened by sweet honey for yet another choice; unexpectedly, it's the spiciest of the three dips. You'd think that the bold flavors of each sauce would take over — at best drowning out the others, at worst clashing to create a cacophony. They don't. Each maintains its unique point of view in the midst of vastly different ones, synthesizing the dissimilitude into a complete dish. It's the culinary equivalent of e pluribus unum. In other words, it's a ... polite society. Schmitz and Schoen think the world needs more of this accommodation and politeness, and it's hard to argue otherwise. After all, the restaurant opened almost exactly one month after our country inaugurated a president who sports incivility as a badge of honor. 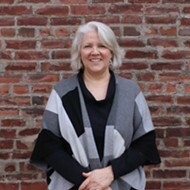 Amidst the insults hurled by both sides, the vitriol on social media and a general atmosphere of intolerance, the business partners sensed a desire for something different — a community of well-intentioned people in an environment with an emphasis on consideration. 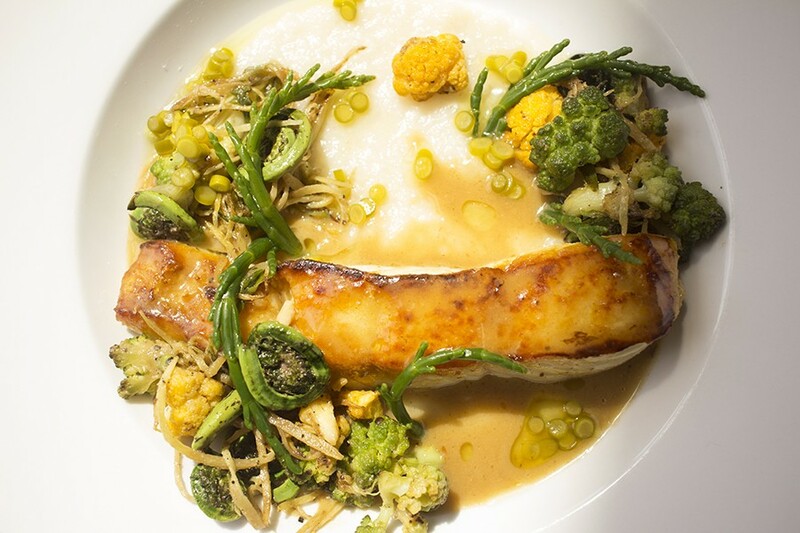 Lacquered halibut is served with miso butter, jasmine congee, fiddle heads, confit garlic scapes, sea beans, cauliflower and broccoli. What that translates to in restaurant terms is a bar and dining space that makes you feel like an invited guest in someone's stylish Lafayette Square home. 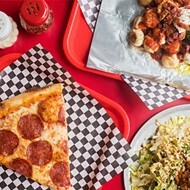 Schmitz and Schoen feel a responsibility to be a beacon to the neighborhood, so they've created a menu that has as much to offer someone looking for a cocktail and quick bite as someone looking for a multi-course dinner. Add to the mix a thoughtful beverage list and servers who provide easy hospitality and, well, let's just say that if the world was more like Polite Society, we'd all be the happier for it. 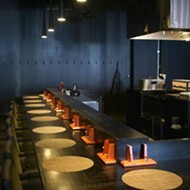 Part of the allure is the environment the owners and their team have created. Located in the former home of Ricardo's, an Italian spot that finished a 26-year run in 2015, Polite Society is a lovely space that looks straight out of a Lafayette Square home tour. Like Ricardo's, the restaurant is divided into three rooms. 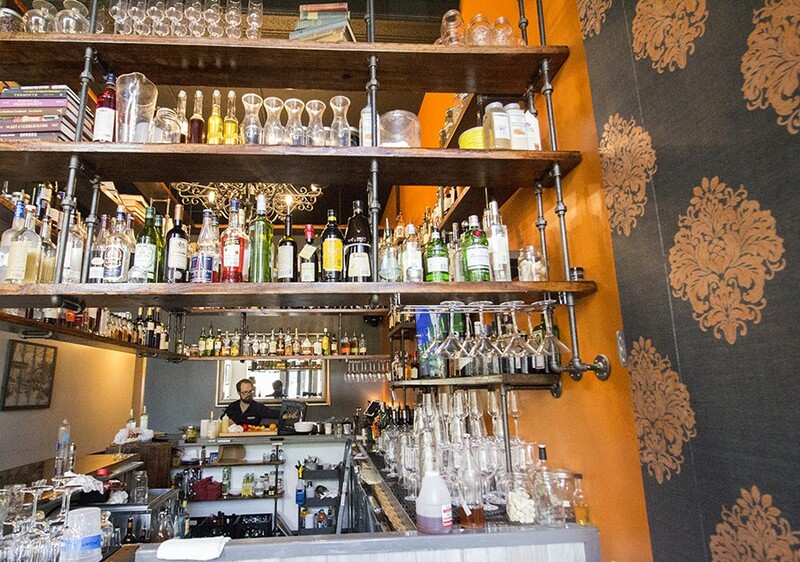 Guests enter the bar, where suspended shelves are filled with liquor, trinkets and books. 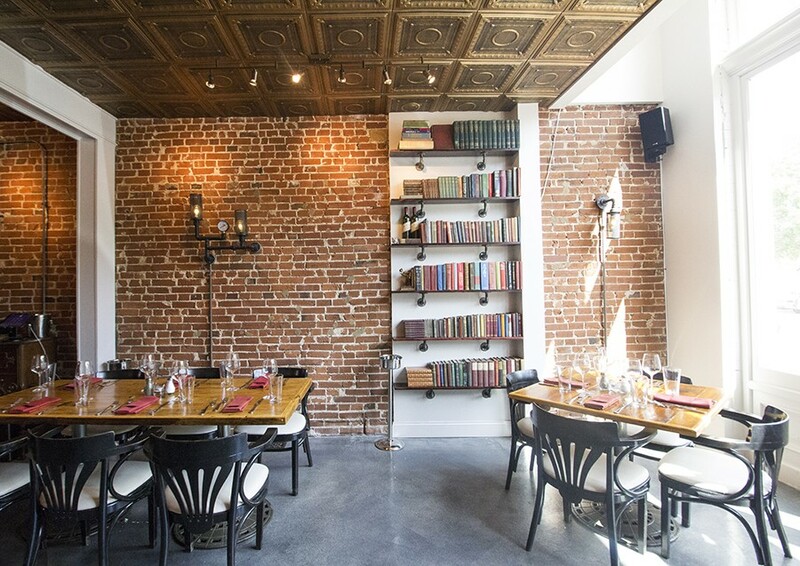 Through a small doorway, you enter the first of two dining rooms where exposed brick, tin ceilings and built-in bookshelves create a warm feel. It's elegant but not fussy, a microcosm of the gracious neighborhood it inhabits. 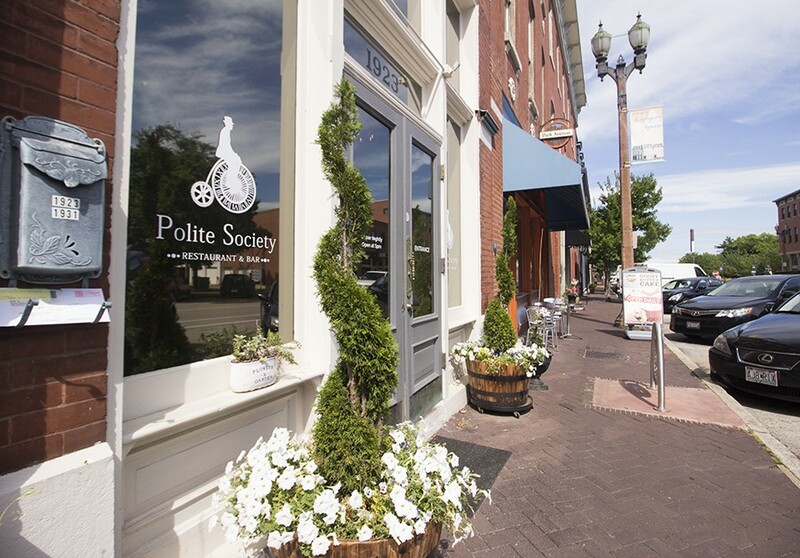 Dining at Polite Society feels like dining in a posh Lafayette Square home. Schmitz and Schoen tapped Thomas Futrell, formerly of Scape, to head the kitchen, and his menu is eclectic yet somehow cohesive. 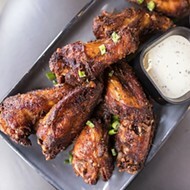 In addition to those wings, the restaurant offers "appetizers" and "bites and sides" meant either to whet your appetite for the main course or to satisfy your need to snack while having an aperitivo. Deviled eggs, an ever-present menu staple these days, go beyond the usual mayonnaise and mustard template. Spiked with cayenne, the eggs are infused with the pleasant funk of trout roe, balanced out by pungent capers. Another snack, the roasted asparagus, wraps the vegetable in speck (a cured, northern Italian ham similar to prosciutto) and pairs it with preserved lemon aioli and rich ricotta salata. It's as rich as a meat-centric main course, up to the edge of too much unless paired with a bracing white wine. The head-on, tail-off shrimp, served on the shrimp and grits appetizer, are perhaps the purest version of the shellfish I've encountered. They're so full of flavor, the blackened seasoning that coats them acts like an accent, not a cover. They're paired with cheesy grits, garlicky sofrito and a lime crema that brightens the wonderful dish. "Crispy Okabe" is a terrific option for tofu eaters. 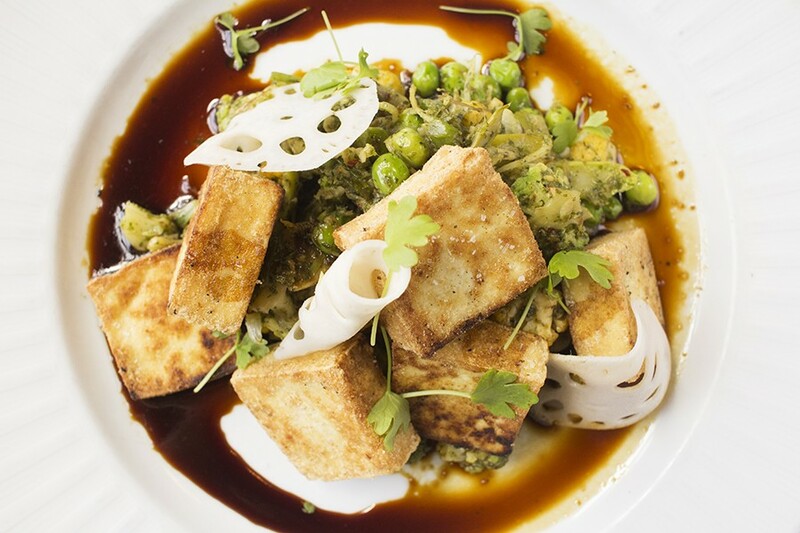 You could make a satisfying meal from any combination of these first courses, but then you'd miss out on the "Crispy Okabe," a platter of creamy brown rice-dusted tofu glazed with soy and molasses. A cauliflower stir-fry underscores the tofu's earthiness, while the cilantro ginger pesto gives an herbaceous and spiced punch. On its own, the tender, panko-crusted chicken cutlet that comprises the "Chicken Schnitzel" is a touch bland, but when paired with the vinegar-based German potato salad and balsamic-dressed greens, the seasoning level is perfect. Halibut is equally well-prepared. The gossamer fish flakes apart into a bowl of jasmine-scented congee (rice porridge) that soaks up the accompanying miso butter, making it almost like a risotto. Fiddle heads, garlic scapes, sea beans, cauliflower and broccoli complete this lovely plate. Pork osso bucco with herb and goat cheese polenta, treviso and heirloom tomatoes. Pork osso bucco is perfection of the form. 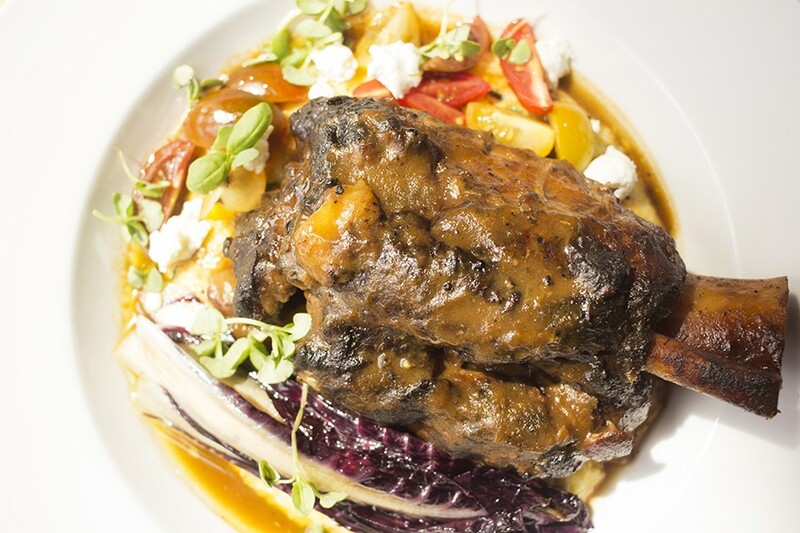 The hearty shank falls off the bone into a plate of goat cheese polenta and charred treviso, a type of chicory. Marinated heirloom tomatoes give a burst of acidity that balances the meat's rich flavor — maybe not enough to make me want to eat this on a 100-degree day, but come autumn, it would be my recommended entrée. I've come to the realization that if a place like Polite Society puts a burger on its menu, you should probably try it. This was confirmed by the "Jimmy Burger," a stack of two juicy patties interspersed with molten American cheese, onion straws, a sweet and smoky tomato glaze, and whole grain mustard aioli all piled onto a malty pretzel bun. It's as good as it sounds. Travis Hebrank at work at the bar. That same pretzel bun serves at the base of the restaurant's signature dessert: the chocolate pretzel bread pudding. The thick slab occupies the space between a traditional bread pudding and a fudgy brownie. Paired with crème anglaise, you'll be surprised how much of this delightful treat you can eat, even though you should have been filled by the preceding savory courses. The shockingly talented Travis Hebrank and his lovely bar program cannot go unmentioned. His wine and beer list is thoughtful, and his cocktails exist in that rare sweet spot of being interesting yet still drinkable. However, his enthusiasm for what he's serving, which he can't help but share, is so infectious, it helps to define the personality of the place and places him in the top tier of the area's bar professionals. It's that sort of personal touch, coupled with the lovely digs and Futrell's food, that makes Polite Society such a welcome addition to the city's dining scene. Whether it will help us to form a more perfect union remains to be seen, but at least it's making our little slice of the country a more delicious place.